1926-1956: The Great Depression, a stock market crash of more than 80%, World War II, The Korean War and four recessions. 1956-1986: The Civil Rights Movement, the Vietnam War, a president was assassinated and another forced to resign, an oil price shock from the OPEC embargo, double digit inflation and interest rates and six recessions. 1986-2016: Black Monday in 1987, the Savings & Loan crisis, Desert Storm, 9/11, wars in Iraq and Afghanistan and three recessions. The usual caveats apply here: Past is not prologue. - We're a more mature economy now. - These numbers don’t take into account inflation, taxes, fees, etc. - 90 years is a small sample size in the grand scheme of things. 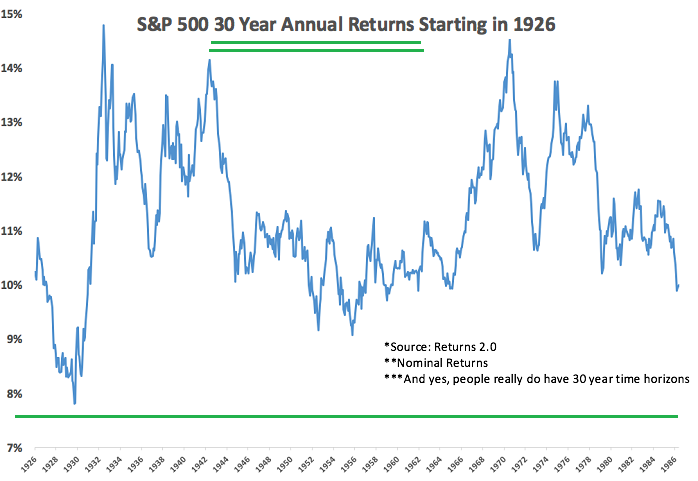 - 30 years is a long time to hold an investment. - Things could certainly be worse from this point forward. You just never know. - Still, it’s hard to look at these numbers and not be optimistic about the future. >> Bad things happen and human progress continues to march on. 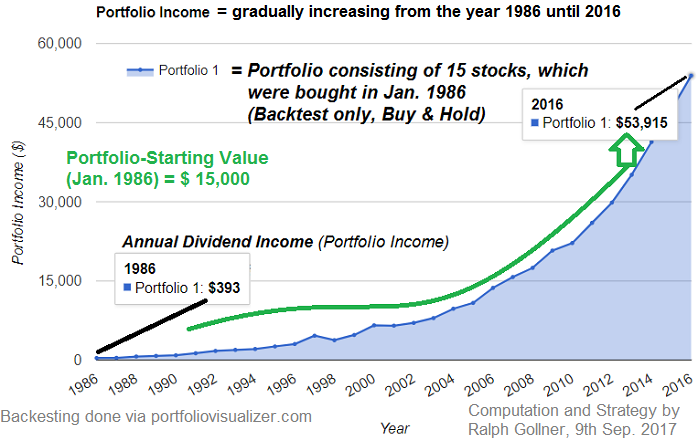 Now to something "else", but in connection with a 30-years-investment horizon and not caring, whatsoever the Stock-Market might be doing with your selected bunch of 15 stocks (Dividend payers / Dividend growers) over time.